We have a no-obligation quote policy. What are you waiting for? It’s a big world, and at Boulter we like big, and we like options. That’s why we don’t stop at specialized packaging and crating your precious cargo. We’ll ship it or receive it for you to. For shipping and receiving, we will take care of selecting the fastest, safest domestic or international shipping options and handle the paperwork, tracking and any other logistics involved. We will act as custodians to your cargo, whether it is shipping out or coming in. 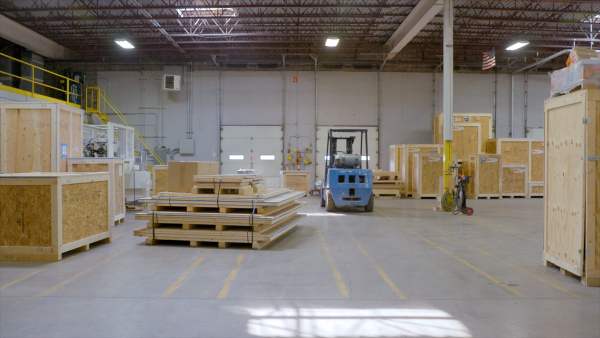 We can also safely store large or small shipments using our warehouse services. "Boulter worked very well with our company to arrange bringing in a machine. They were professional and very easy to work with. They scheduled around our times with the primary shipper and moved through our facility quickly and cleanly. Great job. " "Thanks for the quality service, the staff were very professional and proficient. I'm sure we'll be calling you folks again." "Boulter has long been a trusted and reliable source for rigging at PGM. The staff is cordial, organized and take pride in their work. They provide safe services and make sure they move your equipment in a way that eliminates all chance of damage. I am very pleased with Boulter and Willis goes out of his way to communicate and make the customer happy." "It is always a pleasure to work with Boulter - they are skilled, knowledgeable and customer driven." "We want to congratulate Boulter for the exquisite job of moving, crating, and packing valuable historic statuary and altarpieces. We could not be happier with the results, truly excellent work." "Absolutely the BEST! Lots of care for machinery being moved and the facility being moved into. Well-seasoned and experienced group." "Everything went extremely smooth and without issues and or concerns. As always, a great job by your guys." "Your guys were here early, and the delivery truck was right on time. The machine was unloaded and set in place in just an hour or so. Thank you and your team for making this move-in so simple. Your men were real pros and made it look simple. Thanks to all at Boulter who were involved." "I want to let you know that Jason and Earl did an outstanding job with the skid reduction. And I would like to extend my appreciation to you and the whole Boulter team for excellent service and superior craftsmanship. " "Boulter saved the day when other riggers were not able to do what they said they could. I’ve also had other riggers break pieces off machines because of inexperience. Boulter's riggers are fast, they never break anything, and they make it look easy! I always recommend Boulter Industrial Contractors."